In each direction the scenery is really charming, whether the eye wanders up the river, where the valley of the Derwent expands into a broad vale of fertile beauty, past the isolated mass of Oker Hill, and past Darley Dale, with its ancient church and more ancient yew-tree, where Sir Joseph Whitworth's mansion looks down upon a landscape that inspired the poetic pen of Lord John Manners, right away to the green gloom which smothers old Haddon Hall in one direction and princely Chatsworth in the other ; or whether the gaze follows the river southward to the black rocks of Stonnis near at hand to Lea Hurst, in the middle distance, near the waving woods of Whatstandwell and Alderwasley, made classic by its association with Florence Nightingale ; or to the tower on the top of the great limestone shoulder of Crich Cliff overlooking the rich pastoral country beyond. But the High Tor is really the pride and glory of Matlock. A sheer impending precipice of pale gray, so picturesque as to win admiration, so stupendous as to compel awe ; a white wall of rock nearly four hundred feet high, whose broad base is covered with a wild growth of foliage, but whose solemn face, wrinkled with rents and fissures, and stained with coloured lichens, presents a naked front of lifeless limestone ; a river shaded by hanging trees, brawling past obstructions of islanded rock ; the cliff on the opposite side of the dale corresponding in geological strata and shape, and affording proof that the cliffs have been torn asunder by some past revolution of Nature ; such is the High Tor at Matlock Bath. Derbyshire is famous for giant "Tors." The word is applied in Derbyshire to any lofty mass of precipitous rock, just as "scar" is used in Yorkshire. Chee Tor in Miller's Dale, Mam Tor at Castleton, and the various limestone pinnacles in Dove Dale, are notable specimens of this romantic rock scenery: but they are less imposing in their grandeur than the High Tor, which is without an inland rival, or finds a rival in the St. Vincent Rocks at Clifton alone. finds rare ferns and scarce plants in the wild undergrowth of vegetation that covers the lower part of the rock; while, to the poet, and painter, and the lover of picturesque, the beauty of the kingly bastion never palls, and never appeals in vain for loyal homage. It is a picture, this great mass of grim, gray limestone, rising with imperious sternness high above the festooning foliage and ferns and braids of ivy that cling and climb round the feet of the flinty-souled giant, as if to soften his frowning face with their beautiful appeal of green ; and above the Derwent, that also seems to try to reach the heart of the majestic monarch with its sympathetic song. The Midland railway has forced its iron path through the flinty heart of the High Tor, and the rumbling reverberations of the Pullman express reaches the ear like the grumble of subterraneous thunder. The summit of the crag is easy of access. The road leads through ornamental grounds, and the view across the ravine to the Heights of Abraham, and the steep shoulder of Masson, is very striking. Quarrying operations are, however, robbing the answering cliff across the river or its original contour. The edge of the giddy High Tor cliff may be approached without danger. An iron fence protects what would otherwise be a path of peril, and enables you to gaze down the startling wall of rock right away to the river roaring over the strangled rocks with hoarse music. The High Tor Cavern is of surpassing interest to the mineralogist. It abounds in shining crystallizations of calcareous spar, to which, the geological guides give jaw-jeopardising Latin names. There was in the good old days a hermit's cave on the top of the High Tor. The English Traveller, a curious book on " Our Native Land," published in 1746, states that -" By being at the Pains to clamber on hands and Knees almost to the top of it (the High Tor), may be viewed an Hermit's Cell hewn in the Rock, with a most dreary prospect before it. At one end is a Crucifix and a little Nich, where the Anchorite placed his Saint." No trace of the Hermitage is now to be found, and if descried it would de difficult to obtain an inmate for the cell. The spell of seclusion is broken. To-day a recluse would soon be frightened away by satchelled cheap-trippers, and tourists with opera-glasses. 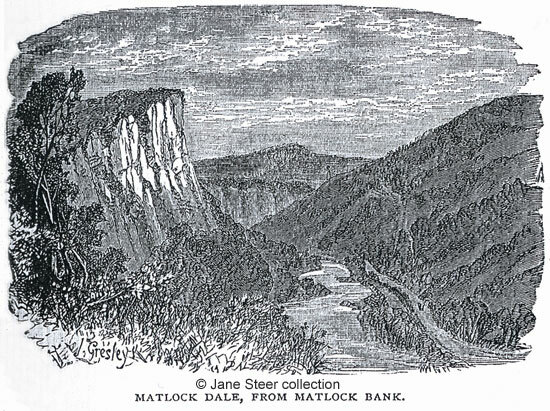 It is a pleasant walk down from the back of the High Tor to the old village of Matlock, a very primitive place compared with Matlock Bath. The church is small, but ancient. The Rev. John Charles Cox places the date of its erection in the reign of Stephen. The tower is the sole surviving portion of the old structure. Inside the church are some interesting relics. Among these is a strong chest. Riveted to it is a chain of about four feet long, to which was formerly secured the Parish Bible, when first deposited there in the sixteenth century.